11 of the worst tattoo ideas, ever! 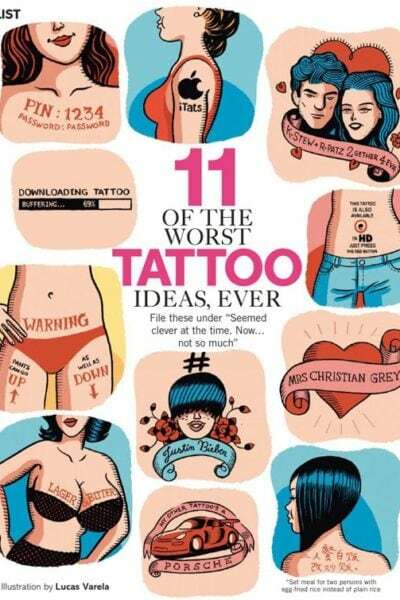 Just couldn't stop laughing at this page on startlingly crazy tattoo designs from Glamour UK's October issue. Surprisingly, I have actually seen four of these proudly displayed on real, living human beings. What's the craziest tattoo you have ever seen? Do tell! ... Read More about 11 of the worst tattoo ideas, ever! The Brazilian is over. Now it’s time to get hair transplants down… there! If you ever had any doubt that we are nothing but a mute herd of sheep riding on the crazy carousel of fashion, I have news for you: the Brazilian wax, which has been EVERYWHERE over the past decade, is now so passé that the It-people won't even acknowledge it any longer. So, all that ghastly hot ... Read More about The Brazilian is over. Now it’s time to get hair transplants down… there!